The prominence of Islam in China is fascinating and a surprise to many, with its long establishment of Muslim communities, a flourishing Islamic history, a spectacular Islamic cultural heritage and its many Mosques. The 'Great Mosque of Guangzhou' is also known as Huaisheng Mosque which means 'Remember the Sage' (A Memorial Mosque to the Holy Prophet) and is also popularly called the 'Guangta Mosque' which translates as 'The Beacon Tower Mosque'. Huaisheng Mosque is located on Guantgta Road (Light Pagoda Road) which runs eastwards off Renmin Zhonglu. Prior to 500 CE and hence before the establishment of Islam, Arab seafarers had established trade relations with the "Middle Kingdom" (China). Arab ships bravely set off from Basra at the tip of the Arabian Gulf and also from the town of Qays (Siraf) in the Persian Gulf. They sailed the Indian Ocean passing Sarandip (Sri Lanka) and navigated their way through the Straits of Malacca which were between the Sumatran and Malaysian peninsulas en route to the South China Sea. They established trading posts on the southeastern coastal ports of Quanzhou and Guangzhou. Some Arabs had already settled in China and probably embraced Islam when the first Muslim deputation arrived, as their families and friends back in Arabia, had already embraced Islam during the Holy Prophet's revelation (610-32). Whilst an Islamic state was founded by the Holy Prophet Muhammad, China was enduring a period of unification and defence. Early Chinese annals mentioned Muslim Arabs and called their kingdom al-Madinah (of Arabia). Islam in Chinese is called "Yisilan Jiao" (meaning "Pure Religion"). A Chinese official once described Makkah as being the birthplace of Buddha Ma-hia-wu (i.e. Holy Prophet Muhammad). There are several historical versions relating to the advent of Islam in China. Some records claim Muslims first arrived in China in two groups within as many months from al-Habasha Abyssinia (Ethiopia). Ethiopia was the land where some early Muslims first fled in fear from the persecution of the Quraysh tribe in Makkah. Among that group of refugees were one of Prophet Muhammad's daughters Ruqayya, her husband Uthman ibn Affan, S'ad Ibn Abi Waqqas and many other prominent Sahabah (Companions) who migrated on the advice of the Holy Prophet. They were successfully granted political asylum by al-Habashi King Atsmaha Negus in the city of Axum (c.615 CE). However, some Sahabah never returned to Arabia. They may have traveled on in the hope of earning their livelihood elsewhere and may have eventually reached China by land or sea during the Sui Dynasty (581-618 CE). Some records relate that S'ad Ibn Abi Waqqas and three other Sahabah sailed to China in c.616 CE from Abyssinia (Ethiopia) with the backing of the king of Abyssinia. Sa'd then returned to Arabia, bringing a copy of the Holy Qur'an back to Guangzhou some 21 years later, which appropriately coincides with the account of Liu Chih who wrote "The Life of the Prophet" (12 vols). One of the Sahabahs who lived in China is believed to have died in c.635 CE and was buried in the western urban part of Hami. His tomb is known as "Geys' Mazars" and is revered by many in the surrounding region. It is in the northwestern autonomous province of Xinjiang (Sinkiang) and about 400 miles east of the latter's capital, Urumqi. Xinjiang is four times the size of Japan, shares its international border with eight different nations and is home to the largest indigenous group of Turkic-speaking Uyghurs. Hence, as well as being the largest Islamised area of China, Xinjiang is also of strategic importance geographically. The Qur'an states in unequivocal words that Muhammad was sent only as a Mercy from God to all peoples (21:107), and in another verse, "We have not sent thee but as a (Messenger) to all Mankind" (34:28). This universality of Islam facilitated its acceptance by people from all races and nations and is amply demonstrated in China where the indigenous population, of ethnic varieties of Chinese Muslims today is greater than the population of many Arab countries including that of Saudi Arabia. The history of Huaisheng Mosque represents centuries of Islamic culture dating right back to the mid-seventh century during the T'ang Dynasty (618-907) - "the golden age of Chinese history". It was in this period, eighteen years after the death of the Holy Prophet, that Islam - the last of the three great monotheistic religions - was first introduced to China by the third Caliph, Uthman Ibn 'Affan (644-656 CE/23-35 AH ). Uthman was one of the first to embrace Islam and memorize the Holy Qu'ran. He possessed a mild and gentle nature and he married Ruqayyah and following her death, Umm Kulthum (both were daughters of the Holy Prophet). Consequently he was given the epithet of 'Dhu-n-Nurayn' (the one with the two lights). Uthman was highly praised for safeguarding the manuscripts of the Qur'an against disputes by ordering its compilation from the memories of the Companions and sending copies to the four corners of the Islamic Empire. Uthman sent a delegation to China led by Sa'd Ibn Abi Waqqas (d. 674 CE/55 AH) who was a much loved maternal uncle of the Prophet and one of the most famous Companions who converted to Islam at the age of just seventeen. He was a veteran of all the battles and one of the ten who it is reported that the Holy Prophet said were assured a place in paradise. In Madina, Sa'd, using his ability in architecture added an Iwan (an arched hall used by a Persian Emperor) as a worship area. He later laid the foundation of what was to be the first Mosque in China where early Islamic architecture forged a relationship with Chinese architecture. According to the ancient historical records of the T'ang Dynasty, an emissary from the kingdom of al-Madinah led by Sa'd Ibn Abi Waqqas and his deputation of Sahabah, who sailed on a special envoy to China in c.650 CE, via the Indian Ocean and the China Sea to the famous port of Guangzhou, thence traveled overland to Chang'an (present day Xi'an) via what was later known as the "Silk Route". Sa'd and his deputation brought presents and were warmly received at the royal court by the T'ang Emperor Kao-tsung, (r. 650-683) in c.651 CE despite a recent plea of support against the Arabs forwarded to the Emperor in that same year by Shah Peroz (the ruler of Sassanids Persia). The latter was a son of Yazdegerd who, along with the Byzantines already had based their embassies in China over a decade earlier. Together they were the two great powers of the west. A similar plea made to Emperor Tai Tsung (r.627-649) against the simultaneous spread of Muslim forces was refused. First news of Islam had already reached the T'ang royal court during the reign of Emperor Tai Tsung when he was informed by an embassy of the Sassanian king of Persia, as well as the Byzantiums of the emergence of the Islamic rule. Both sought protection from the might of China. Nevertheless, the second year of Kao-tsung's reign marks the first official visit by a Muslim embassador. The emperor, after making enquiries about Islam, gave general approval to the new religion which he considered to be compatible with the teachings of Confucius. But he felt that the five daily canonical prayers and a month of fasting were requirements too severe for his taste and he did not convert. He allowed Sa'd Ibn Abi Waqqas and his delegation freedom to propagate their faith and expressed his admiration for Islam which consequently gained a firm foothold in the country. Sa'd later settled in Guangzhou and built the Huaisheng Mosque which was an important event in the history of Islam in China. It is reputedly the oldest surviving mosque in the whole of China and is over 1300 years old. It survived through several historical events which inevitably took place outside its door step. This mosque still stands in excellent condition in modern Guangzhou after repairs and restorations. A fine model of the Great Mosque with all its surrounding walls and the magnificent, elegant appearance of its pavilions and courtyards can be seen at the Hong Kong Museum placed gracefully besides the model of the Huaisheng Mosque. I was fortunate to visit the real mosque last year during Asr prayer, after which I met the Imam who showed me an old handwritten Qur'an and presented me with a white cap. Qingjing Mosque is located at "Madinat al-Zaytun" (Quanzhou) or, in English, "City of Olives" (Olive is a symbol of peace according to Arab/Muslim tradition) in Fujian Province, where there are the Sacred Tombs of two Companions of the Holy Prophet who accompanied Sa'd Ibn Abi Waqqas's envoy to China. They are known to the locals by their Chinese names of "Sa-Ke-Zu and Wu-Ku-Su" and Arabs from various countries come to pay homage. According to Chinese Muslim historians, Sa'd Ibn Abi Waqqas died in Guangzhou where he is believed to be buried. However Arab scholars differ, stating that Sa'd died and was buried in Medina amongst other Companions. 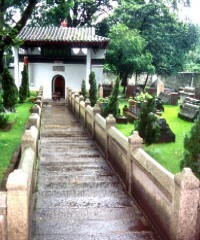 One grave definitely exists, while the other is symbolic, God only knows whether it is in China or Medina. The message of Islam took root peacefully in China. The first envoy reached the southeast via the Zhu Jiang (The Pearl River) and was later followed by contact via an overland route from the northwest. Muslim communities are present over a wide geographical area in China today, including some in the remote places of Tibet, where I once met Tibetan Muslims in the middle of nowhere, while on a trek.